Make your house feel like home with the 9535 collection of casually styled upholstered furniture for you living room, family room or den. 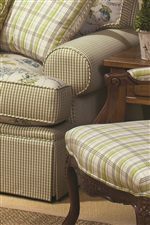 Comfort is key with padded curved arms, deep seats and skirted bases. The 9535 collection is available in your choice of special order fabrics, so you can customize it to fit your style and personal tastes. Make your living room one of a kind with the 9535 collection of upholstered home furnishings. Browse other items in the 9535 collection from AHFA in the area.